Pricing for Outdoor Kitchens - Executive Landscaping, Inc.
Much like the costs of kitchens in homes can range in price – no pun intended – the expense of outdoor kitchens can also vary greatly, depending, naturally, on a number of factors. First off, of course, there is the size of the kitchen. How big a space you dedicate in your backyard will dictate the amount of material you need to use, the time it will take to install those materials and even the number of appliances you can possibly fit into the space. Consequently, the bigger the kitchen, the bigger the price tag becomes. For more bare-bones kitchens that include the standard patio, typical grill and possibly a countertop, installation could be as little as a few thousand dollars. By contrast, kitchens with luxury appliances and a complex design will quickly make that amount multiply. It all comes down to your own personal taste and what your needs are. And, of course, what your vision entails. Ultimately, the sky is the limit, so outdoor kitchens can be a place to let your imagination run wild if you have the budget. 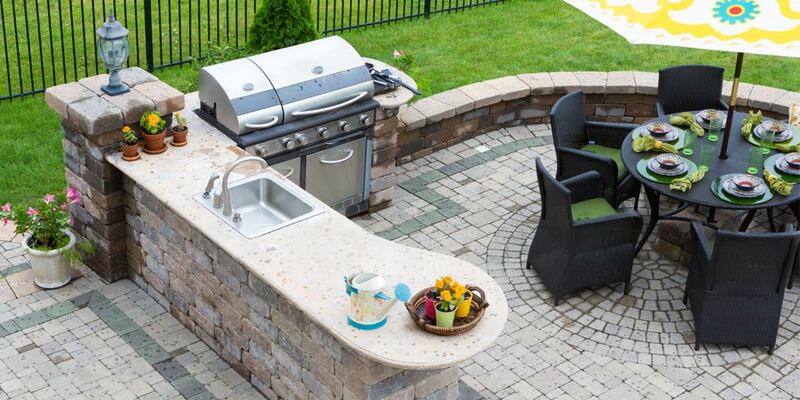 Additional cost factors of creating outdoor kitchens involves everything from whether the kitchen will comprise all new custom built structures or prefabricated frames that are finished on-site with more decorative surfacing and details. Therefore, setting a “standard” cost projection is nearly impossible. Material is of extreme importance. Some materials cost far more than others, which means that using the more moderately priced options will be much more within the realm of possibility for some people’s budgets. Others may spend more freely on the top-of-the-line materials. Beginning with the framework itself, you’re looking at an average of $200 per linear foot for the raw frame of a prefabricated frame, if that’s the way you’ve decided to go. More custom builds will run more, depending on your region and contractor, so it’s important to get an estimate before you begin any project. The cost of surfaces for your framework material also varies greatly. Stucco generally comes in at the lowest price per square foot, with manufactured stone and brick veneer next. Standard brick natural stone generally has the highest cost per square foot. And then there are the countertops, with weatherproof bluestone countertops at the lower end of the price points, granite coming next and poured concrete countertops topping the list. Generally speaking, there are two location categories of outdoor kitchens – both of which greatly influence cost. Location is huge in determining the expense involved, as tying in utilities can be a great undertaking for kitchens that are close to the house as opposed to those located farther away from the house. The separated kitchens, also referred to as “satellite” kitchens, must be self-sufficient and have their own separate access to utility lines like electricity, gas, and water as well as proper sewage. “Perimeter” kitchens, by contrast, are able to have their utilities tied into those that feed the house, which means that no extra lines will have to be run under the ground. Last – but hardly least, in terms of cost – are the appliances you select to finish off your outdoor kitchen. Believe it or not, appliances are actually the biggest hit to the budget – especially the grills. Drop-in grills are generally the more affordable option, while truly top-end grills with multiple burners and stations may cost five-figures. Grills are foundational to any outdoor kitchen, by anyone’s standards, and they often range in price, depending on their size and BTUs. Next up are sinks, icemakers, cooktops and ovens, and – of course – what kitchen would be complete without a refrigerator? Depending on size, finish, and features, your appliances can all be truly budget-friendly or something on the more chef-grade end of the spectrum. Your outdoor kitchen should be a space that really gives your backyard some sizzle. At Executive Landscaping, Inc. we’ve been designing and installing beautiful kitchens in backyards all over the Gulf Coast for years. Our design team will meet with you to discuss your goals and your budget to devise a plan that gives you options for each element, which will ultimately be used to make your final decisions. Naturally, the smaller the budget, the more specific we have to be in those plans. Freedom comes with bigger budgets, but we make masterpieces with every project we take on. If your budget will not accommodate the full scope of your dream, we can create a modular design that easily allows expansion-phased planning so that your masterpiece can still happen!